Many utilities have witnessed, or are anticipating, rapid growth in customer-owned distributed photovoltaics (DPV). This has prompted utilities to take a closer look at how they account for DPV growth within their resource planning processes and, in particular, their DPV adoption forecasting methods. Current resource planning practices in this area vary widely, and the state-of-the-art in DPV adoption forecasting is undergoing continuous refinement. 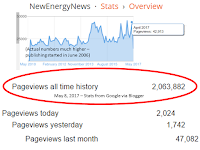 Utility resource planners may have an interest in improving their DPV forecasting techniques. However, such improvements entail costs related to new tools, training, staffing, or contractors. 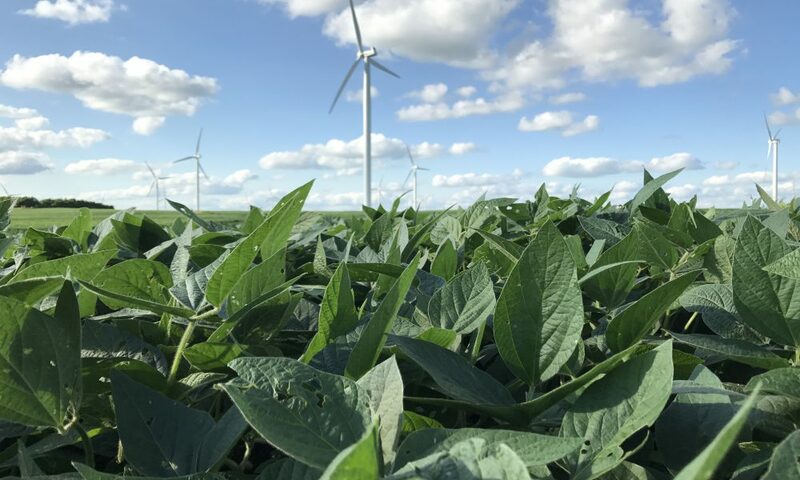 Assessing whether such investments are worthwhile therefore requires some understanding—and ideally quantification—of the potential benefits associated with improved DPV adoption forecasting. 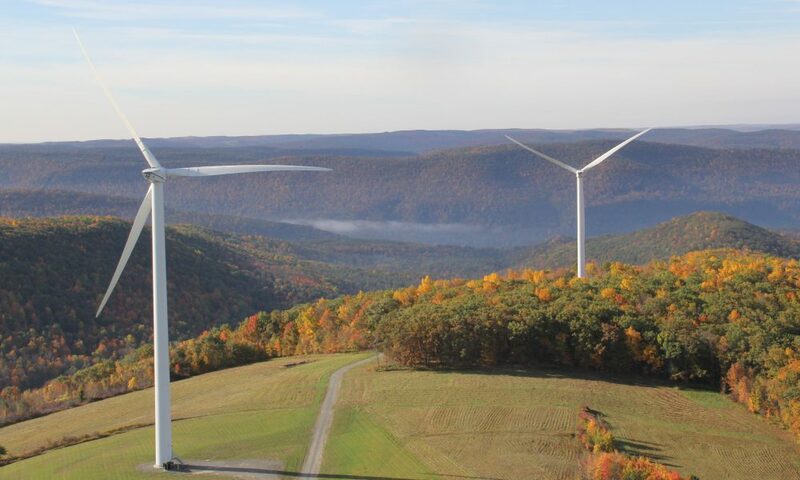 This report informs these tradeoffs by estimating how improved DPV adoption forecasts used in utility resource plans can reduce future utility capital and operating costs. 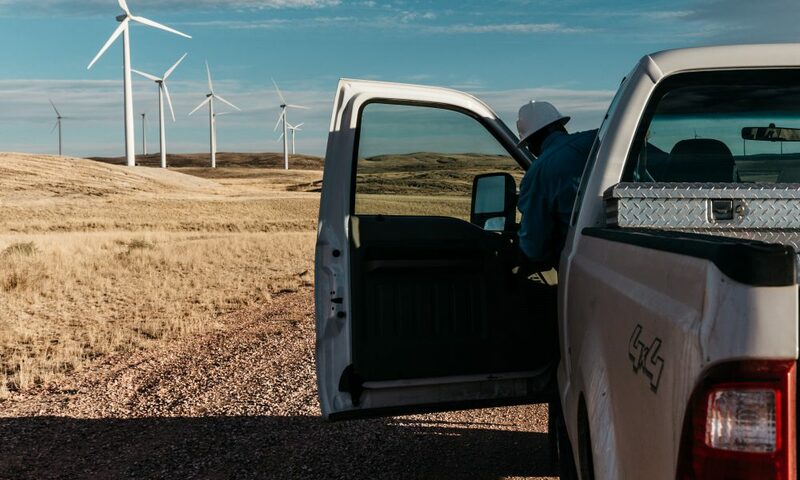 We simulate future capital and operating costs for the entire Western Interconnection under varying assumptions about the accuracy of the DPV forecasts used to develop generation-expansion plans. We then describe a simplified probabilistic method that individual utilities could implement for their own service territories to estimate the potential benefits from improving their DPV forecasting capabilities. To be clear, this analysis exclusively considers the bulk power system. Depending on their locational precision, improved DPV forecasts could also benefit distribution system planning, but those impacts are outside the scope of this work. The analysis relies on a staged series of models: the National Renewable Energy Laboratory’s (NREL’s) Distributed Generation Market Demand model (dGen) to project DPV adoption over time; NREL’s Resource Planning Model (RPM), a capacity-expansion model, to simulate the least-cost buildout of the bulk power system; and PLEXOS, a commercial production cost model developed by Energy Exemplar, to simulate operation of the bulk power system. Using this suite of models, we estimate the present value of capital and operating costs for the Western Interconnection over a 15-year analysis period (2016–2030) across a wide range of scenarios encompassing varying levels of DPV growth and misforecasting. The 15-year analysis period comprises a series of 5-year planning increments, within each of which a new capacity-expansion plan is developed and implemented based on an erroneous DPV forecast. The presentvalue capital and operating costs under these plans are then compared to the costs under a scenario with perfect DPV forecasting, to quantify the cost of the forecasting error. 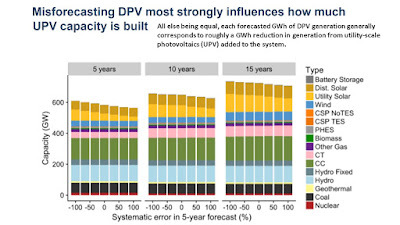 The utility-cost impacts of misforecasting DPV adoption can be non-trivial. Within our base-case analysis, systematically misforecasting DPV adoption over multiple successive planning cycles increases the present value of utility system costs by up to $7 million per terawatt-hour (TWh) of electricity sales, relative to utility system costs under a perfect forecast (the upper left-hand corner of Figure ES-1).1 Thus, for a relatively large utility with 10 TWh/year of sales, this translates to a $70 million present-value cost. This cost estimate is for a relatively extreme scenario—in which the contribution of DPV within the total generation portfolio increases by 8.5% over a 15-year period, but the utility does not assume any incremental DPV growth in each of three successive 5-year expansion plans. Naturally, the cost impacts are less acute in cases with less DPV growth or a smaller degree of misforecasting. For example, for a utility with DPV growth equal to just 2% of total energy generation over 15 years or a forecasting error of just ±25%, the cost of misforecasting is less than $1 million per TWh of electricity sales. 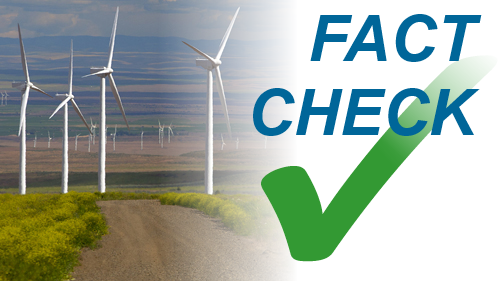 These misforecasting costs, even under the most extreme conditions, are small relative to any utility’s overall cost of service. However, from the perspective of a utility resource planner, the relevant metric to consider would be the relative costs and benefits on any investment or contract, not just the absolute benefits. The results in this report suggest DPV forecasting improvements are likely to be profitable in some cases (e.g., if large DPV growth is expected but would otherwise not be incorporated in resource planning) but not others (e.g., if DPV growth is expected to be minimal). A utility can use the estimates of benefits given in this report, and their own estimates of the costs of improvements, to determine where they fall on that spectrum. The cost of misforecasting can be asymmetrical. The cost impact cited above ($7 million per TWh of retail sales) corresponds to a scenario with severe underforecasting of future DPV generation. 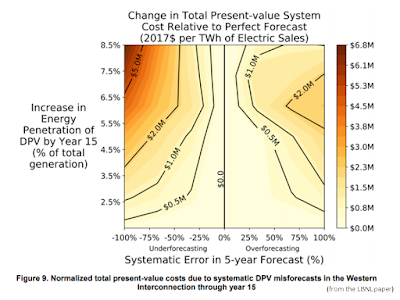 In contrast, the costliest overforecasting increases utility system costs by just $2 million per TWh within our basecase analysis (i.e., 100% overforecasting at 6.5% DPV increase in Figure ES-1). These particular results are specific to the system modeled in this analysis. 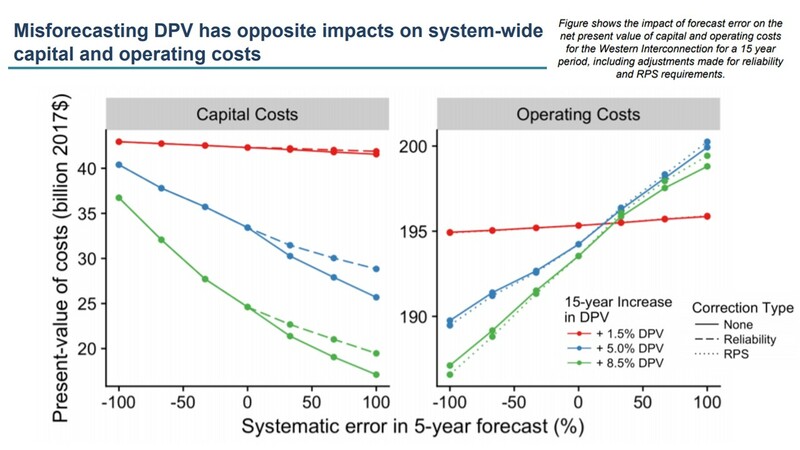 In general, underforecasting DPV tends to increase capital costs but decrease operating costs (relative to a perfect forecast), while overforecasting DPV does the opposite. Accordingly, the magnitude and direction of any asymmetry depends on the relative degree of sensitivity of capital and operating costs to DPV forecast error. This phenomenon can have practical implications for utility resource planners, because the expected direction and magnitude of asymmetry can influence what amount of DPV in a resource plan minimizes the expected costs of misforecasting. The cost of misforecasting is sensitive to market and planning conditions. The Western Interconnection, as modeled in this analysis, is oversupplied with capacity in the initial years of the planning period. This partially explains the asymmetry noted above, because an initially overbuilt system may not require new capacity additions for the initial years of a planning period, and thus overforecasting DPV adoption (i.e., underforecasting load growth) has a muted impact on capacity-expansion decisions. 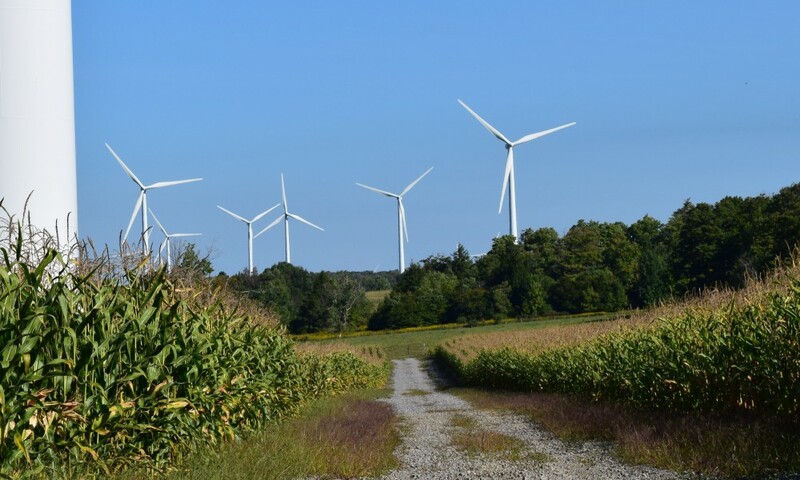 As another example of how specific utility system conditions may impact the cost of misforecasting DPV adoption, our analysis also highlights the importance of renewable energy credit (REC) prices if a utility includes anticipated DPV RECs in its renewable portfolio standard (RPS) compliance planning. In a sensitivity case with roughly a $20/MWh increase in REC prices (the “High REC Price” case in Figure ES-2), the cost of severely overforecasting DPV in the high-DPV case rises from $1 million per TWh of retail sales in the base case to roughly $8 million. This is due to the additional cost of having to purchase RECs to cover RPS compliance shortfalls. Conversely, the cost of severely underforecasting DPV falls from $7 million per TWh to $2 million, due to the additional revenues from the sale of surplus RECs. Features and findings from the other sensitivity cases depicted in Figure ES-2 are discussed further in the main body of this report. 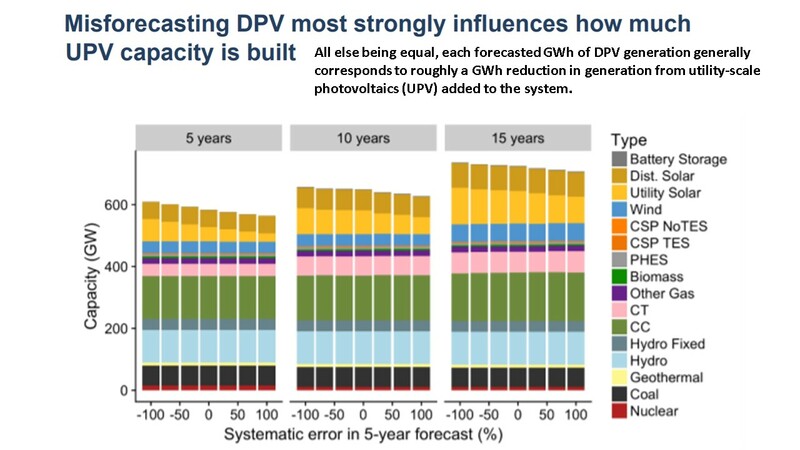 Some level of uncertainty in DPV adoption forecasts is inevitable, partly owing to policy and market drivers (e.g., future PV cost trajectories, future changes to net metering rules, etc.) that are inherently uncertain. However, uncertainty in DPV adoption forecasts also partly derives from methodological shortfalls—i.e., oversimplifications or misrepresentations of the dynamics underlying customer adoption. 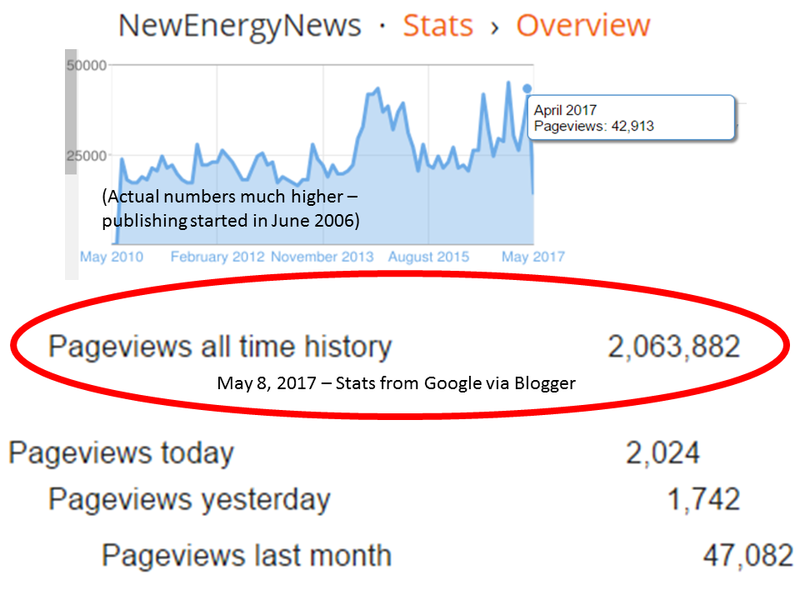 It is that source of uncertainty that utility resource planners can potentially address through improved DPV forecasting techniques. A utility interested in evaluating the potential benefits from improving its DPV adoption forecasting methods must therefore compare the expected costs of DPV misforecasting under its current approach against the expected costs under an improved approach with reduced uncertainty. 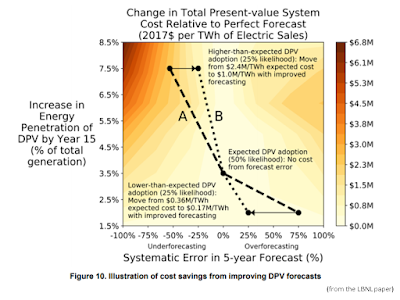 As mentioned above, we use the modeled costs of DPV misforecasting to present a simplified probabilistic method enabling estimation of the cost savings due to reducing DPV forecast uncertainty under specific utility conditions. In the example illustrated in Figure ES-3, a large utility with 10 TWh/year of retail sales that is planning for DPV growth of 3.5% of total generation over 15 years would expect present-value savings of $4.0 million by reducing its DPV forecast uncertainty from roughly +75%/-55% to ±25%. These benefits would, naturally, be larger for a utility with more-significant DPV growth and/or for improvements in DPV adoption forecasting methods that yield a larger reduction in forecast uncertainty. 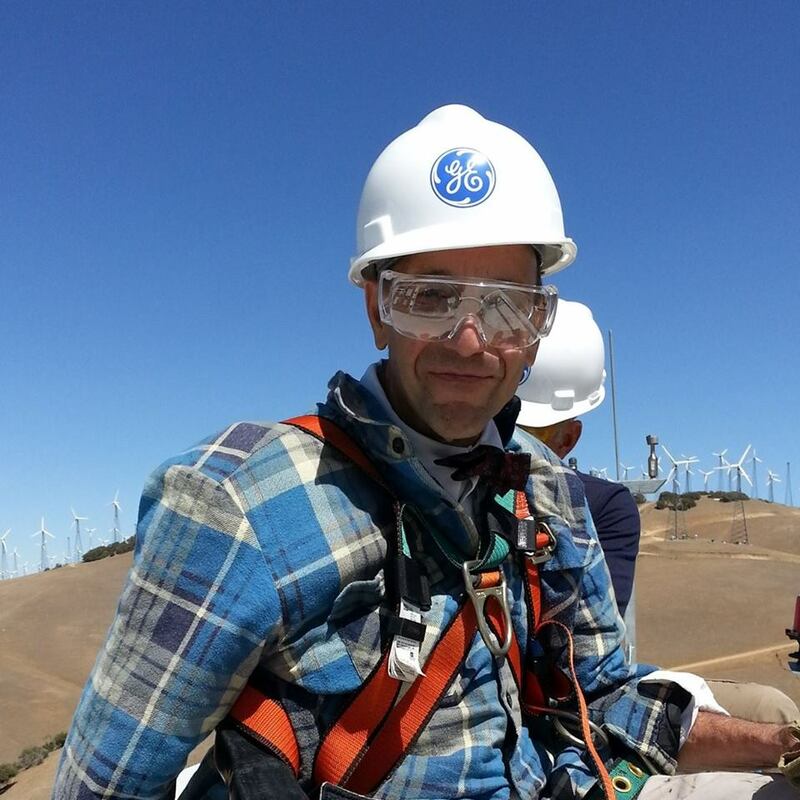 Current utility resource planning practices vary widely in terms of the sophistication of their approach to forecasting future DPV adoption, and the state-of-the-art in DPV adoption forecasting is undergoing continuous refinement. Utility resource planners may have an interest in improving the DPV forecasting techniques used within their planning studies, because reducing the uncertainty in those forecasts may enable more-optimized resource plans and thus ultimately lower the costs to build and operate their system. However, implementing such improvements entails costs related to new tools, training, staffing, or contractors. 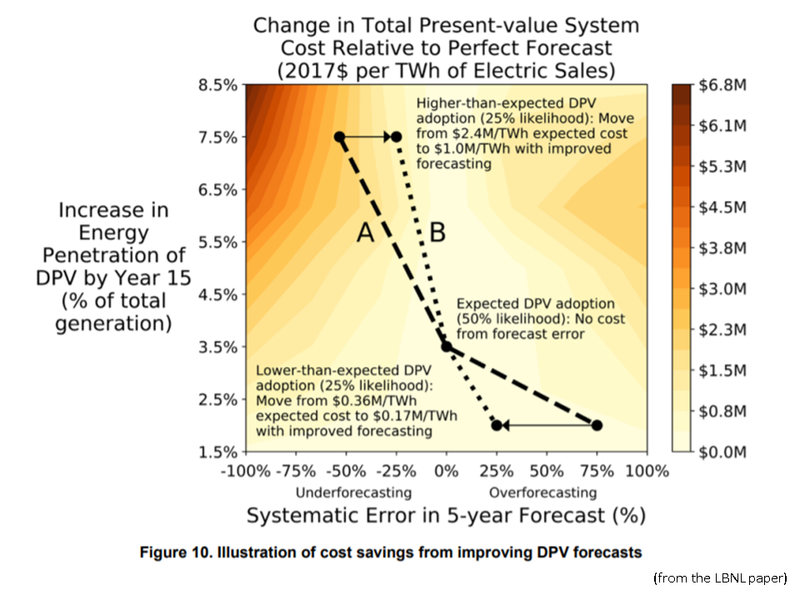 Assessing whether such investments are worthwhile therefore requires some understanding of the potential benefits (i.e., future cost savings) associated with improved DPV adoption forecasting. 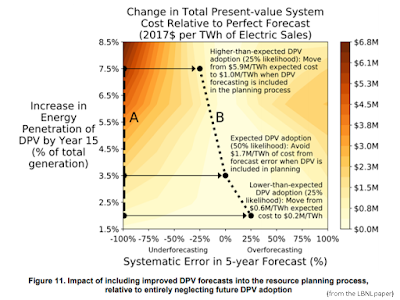 • The utility-cost impacts of misforecasting DPV adoption can be non-trivial. 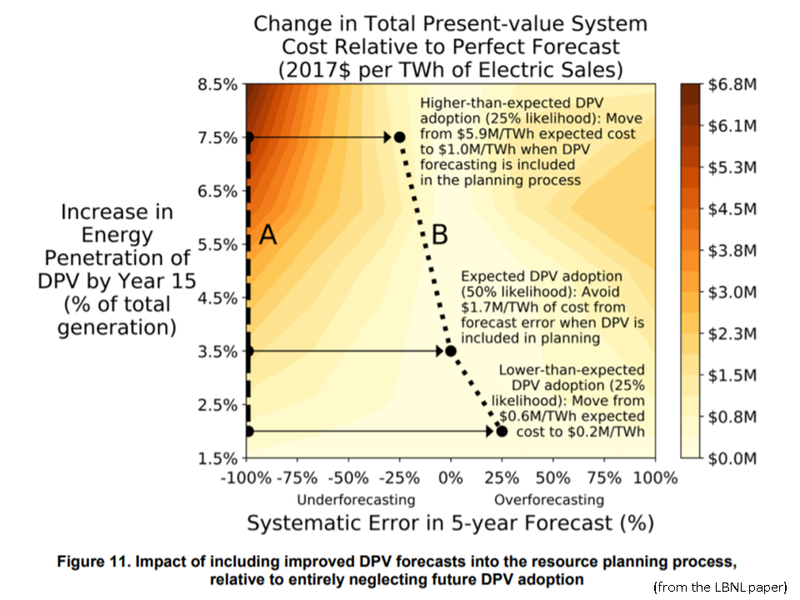 Within our base-case analysis, updating resource plans for DPV adoption once every 5 years while neglecting future adoption in resource plans over a 15-year period increases the present value of utility system costs by up to $7 million per TWh of electricity sales, relative to utility system costs if DPV forecasting were perfect. This would equate to an increase in total costs of about 0.5%. Naturally, the cost impacts are less acute in cases with less DPV growth or a smaller degree of misforecasting. For example, for a utility with DPV growth equal to just 2% of total energy generation over 15 years or a forecasting error of just ±25%, the cost of misforecasting is less than $1 million per TWh of electricity sales, within our analysis. • The cost of misforecasting can be asymmetrical. The cost impact cited above ($7 million per TWh of retail sales) corresponds to a scenario with severe underforecasting of future DPV generation. In contrast, the costliest overforecasting increases utility system costs by just $2 million per TWh within our base-case analysis. These particular results are specific to the system modeled in this analysis. 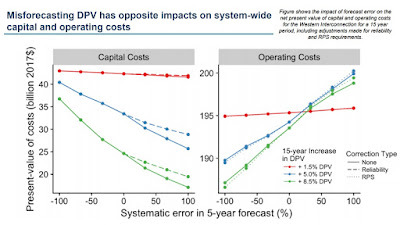 In general, underforecasting DPV tends to increase capital costs but decrease operating costs (relative to a perfect forecast), while overforecasting DPV does the opposite. Accordingly, the magnitude and direction of any asymmetry depends on the relative degree of sensitivity of capital and operating costs to DPV forecast error. • The cost of misforecasting is sensitive to market and planning conditions. The Western Interconnection, as modeled in this analysis, is oversupplied with capacity in the initial years of the planning period. This partially explains the asymmetry between over- and underforecasting observed in our base case, because an initially overbuilt system typically requires less new capacity additions for the initial years of a planning period, and thus overforecasting DPV adoption (i.e., underforecasting load growth) has a muted impact on capacity-expansion decisions. As another example of how specific utility system conditions may impact the cost of misforecasting DPV adoption, our analysis also highlights the importance of REC prices if a utility includes anticipated DPV RECs in its RPS compliance planning. In a sensitivity case with roughly a $20/MWh increase in REC prices, the cost of severely overforecasting DPV in the high-DPV case rises from $1 million per TWh of retail sales in the base case to roughly $8 million. This is due to the additional cost of having to purchase RECs to cover RPS compliance shortfalls. Conversely, the cost of severely underforecasting DPV falls from $7 million per TWh to $2 million due to the additional revenues from the sale of surplus RECs. The quantitative estimates developed in this report are based on a specific electric system and period, and they rely on a host of assumptions about market and policy conditions during that period. Using our simplified probabilistic method, analysts can make first-order estimates of the potential cost savings from improved DPV forecasts. Naturally, these estimates are most useful if followed by a robust examination of how each analyst’s unique circumstances may deviate from the environment assumed in our modeling. That said, we hope the estimates obtainable from this report will offer a useful starting point for planners seeking to evaluate the merits of investing in improved DPV forecasting methods.